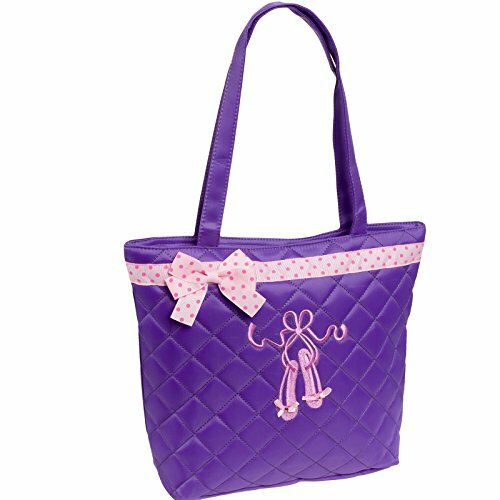 Lil Princess Quilted Dance Ballet Slippers Tote Bag, Lavender | What Should I Say? Let your little girl head to practice with this dance ballet slippers tote bag. The spacious design is ideal for your little girl storing her dance shoes and outfit. A zipper closure securely keeps all your belongings right where you want them so you won't have to worry about someone trying to snoop around or your bag tipping over and spilling everywhere. The nylon lined interior features a zip pocket on the back wall that's great for storing a phone or small wallet and can be spot cleaned when needed. The quilted front features embroidered ballet slippers with rhinestone accents and a polka dot bow. Measures 12.75" x 10.75" x 3.25". If you have any questions about this product by Lil Princess, contact us by completing and submitting the form below. If you are looking for a specif part number, please include it with your message.